After two years of declining sales and an uncertain future, leaders of the biggest food and beverage companies must be questioning their relevance in an era of unprecedented change. These are tough times to run a huge, age-old business. Just ask Sears or JCPenney, Radio Shack or Kodak. Or Conagra and many other big-name food and beverage companies. One by one, the CEOs and CFOs of 15 of the largest food and beverage companies told financial analysts in February to expect a year of lower sales but potentially higher profits, the latter thanks to aggressive cost-cutting. While it worked last year and may work again this year, lower sales plus cost-cutting is not a formula for long-term success. 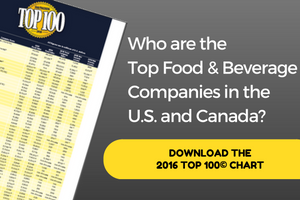 So how will big food and beverage companies return to growth? The Consumer Analysts Group of New York (CAGNY) meeting, held every February in Florida, is a four-day pulse-check of how Big Food is doing. This year, executives attended from General Mills, Tyson, Hostess, Kellogg, Mondelez, Snyder’s-Lance, J.M. Smucker, Campbell Soup, PepsiCo, Clorox (don’t forget Hidden Valley Ranch dressings) Danone, Coca-Cola, Constellation Brands, Nestle and Unilever. With the exception of the leaders of Tyson and Hostess, the CEOs were talking headwinds, not tailwinds, and implicitly struggling with the relevance of Big Food in an era when small, local and minimally processed are prized attributes. They were defending 100-year-old brands and products with sales north of a billion dollars … but have been slipping in sales for several years now. Campbell soups, Oreos and Frosted Flakes were what baby boomers grew up on. But as that generation dies off, millennials, already the biggest demographic, are stocking their refrigerators with other things. Several speakers made reference to the week-earlier news of Kraft Heinz offering $143 billion to buy Unilever. It wasn’t just an acknowledgement of that recent news event; it was a concern hanging over all of them. Rumors have been circulating for a year that Kraft Heinz was interested in Mondelez, then General Mills. Who else? If Kraft Heinz (and its investors 3G Capital and Berkshire Hathaway) could raise $143 billion, no American (or global) food and beverage company was beyond reach. But the CEOs at CAGNY were brand- and company-builders, not slash-and-burn industry consolidators. How will any of these companies respond if presented with a hostile offer? Going global once was seen as the holy grail for lagging sales. Seven billion people outside the U.S., especially in developing nations, were clamoring for better-quality, American-style food, so the thinking went, and their incomes were rising enough to let them afford it. So every American food and beverage company set up shop in foreign lands to mine the gold there. However, the world has become an inhospitable place. China’s economy is stalled, several other nations are devaluing currency and Venezuela is seizing assets. The European Union may be breaking up. A strong dollar isn’t helping. What’s a multinational to do? “Nobody’s talking about globalization anymore,” offered Benno Dorer, chairman and CEO of Clorox. So if you can’t find growth overseas, how do you grow your company in this climate? Putting America first is not just President Donald Trump’s slogan; it’s being adopted by America’s largest food & beverage companies. With what’s going on in the rest of the world, they seem to be embracing the philosophy, maybe even taking seriously the president’s threats that there will be consequences for American companies that make products abroad and sell them at home. Mondelez is one of the most global of U.S.-based food companies, so with trepidation Rosenfeld talked at CAGNY of a worldwide “backlash against globalization,” including Britain’s withdrawal from the European Union, many countries closing their borders to immigrants and the U.S. president’s disdain for trade agreements. She also noted a slowdown in gross domestic product in most of the world’s economies. While her company remains global, Mondelez is pulling back a bit. In 2015, it contributed the European coffee business that it inherited with the Jacobs Suchard acquisition into Jacobs Douwe Egberts, now based in Netherlands, and Mondelez recently divested local brands in France and Australia. Most of the product success stories she offered at the CAGNY meeting were Mondelez’s foreign brands that are being adapted into U.S. products. Barni is a Russian brand that is reinvigorating Teddy Grahams. Big Crunch Bars are taking the Oreo brand into the candy bar space, thanks to development work from Mondelez’s German holding Milka. In his CAGNY remarks, Chief Growth Officer Tim Cofer lauded breakfast biscuit BelVita as “the little French brand” that Mondelez has built into a $600 million global brand. Campbell Soup Co. also appears to be hunkering down. In her remarks to CAGNY, Denise Morrison, president and CEO, ticked off a number of recent business decisions: exiting Russia in 2011, selling off its European “simple meals” business and closing a Mexican plant. Late last year, General Mills started closing snack-manufacturing facilities in Brazil and China, eliminating about 860 positions across the two countries, and a baking mix and frozen dough plant in Berwick, U.K., where 265 were employed. A month after CAGNY, in its FY2017 third-quarter report, General Mills noted organic sales in Europe & Australia were declining by 3 percent (with foreign exchange rates exacerbating the loss) and Asia & Latin America sales were down 4 points. Jeff Harmening, president for nine months now, said two of his priorities are growing the cereal business worldwide and returning China sales to growth. Kellogg, which had just concluded a year of lower overall sales but higher profit, noted its European business lost sales, driven by adverse currency translation and “a challenging environment” in the U.K. Sales also dipped in Latin America, even discounting Venezuela but sales grew in Asia-Pacific, Russia and the Middle East. Tyson sold its Mexico and Brazil poultry businesses to Brazilian (and now mostly American) meat firm JBS in 2014. Domestic manufacturing and domestic sales sound good. But of the same old products? Where is the growth? A simple way of staying domestic, increasing sales and re-establishing relevance is to acquire or at least invest in emerging companies in promising niches. The larger story is not new; big companies have been buying smaller ones for years, sometimes paying unbelievable multiples to get into categories. General Mills paid $820 million in 2014 for Annie’s Inc., which had sales of $204 million. There are plenty of other examples. Perhaps it’s better to look – deeply into the books and underpinnings – before you leap. After watching private equity firms, tech billionaires and even a few Hollywood stars pump money into early-stage food companies, most large food companies established their own venture capital funds or divisions last year. While a total buyout could be the result, the immediate goal for most is to pump in some cash for a small share, help with R&D, supply chain and manufacturing matters and generally nurture the small company along until it was deemed a worthy acquisition. Just this April, the General Mills unit invested a reported $3 million in in Purely Elizabeth, a natural granola company. 301 Inc. now lists associations with Beyond Meat, Farmhouse Culture, D’s Naturals, Kite Hill, Tio Gazpacho, Good Culture and Rhythm Superfoods. Campbell wasn’t far behind, announcing Acre Venture Partners at the start of 2016 and subsequently investing in Juicero, Farmers Business Network and Back to the Roots. Campbell CEO Morrison, speaking at Natural Products Expo West a few weeks later, quoted a research firm that reported 411 food-related startup companies have received $8 billion in venture capital funding since 2010. Hain Celestial launched Cultivate Ventures in mid-2016. Kellogg named its investment fund Eighteen94 Capital (the year W.K. Kellogg discovered flaked cereal). Tyson created Tyson New Ventures, and its first investment was in fake-meat producer Beyond Meat (in which General Mills already had a stake). McCormick & Co. started one too. Coca-Cola Co. and PepsiCo have had venture funds for some time. Somewhere in between all that, Chobani started a Food Incubator and, for its inaugural class, selected six food start-ups from among more than 400 applications. The first class just ended in March. The six startups were able to send two or three team members to Chobani’s New York City office to learn about team building and scaling, branding and marketing, packaging and pricing, sales and retail strategy, innovation and manufacturing, food quality and safety and nutrition and food labeling. They got a $25,000 grant to help grow their business, equity-free capital and travel. “What is needed is disruptive change [but] these legacy companies are not good at disruptive change,” says Brian Beaulieu, CEO of ITR Economics (www.itreconomics.com). “One of the toughest calls to make in business is to not let success blind you to the future. It is change or become marginalized and eventually irrelevant. If they don’t change, these legacy brands run the risk of becoming extinct in the Depression Decade of 2030-2040. Why Is Big Food Bad?